Monument, unveiled as part of Victoria's 150th anniversary celebrations, commemorates the original border survey by Alexander Black and Alexander Allan in 1870-1872. The Black Allan Line is the straight piece of the New South Wales and Victorian Borders and was named after the two surveyors that undertook the mission to map the line from the Cape Howe to the nearest source of the Murray River. The Black Allan Line is made up of a series of cairns and other survey marks, including trenches and the line cleared, some of which is no longer visible. THIS MONUMENT COMMEMORATES THE ORIGINAL BORDER SURVEY BY SURVEYORS ALEXANDER BLACK AND ALEXANDER C.ALLEN IN 1870-1872. 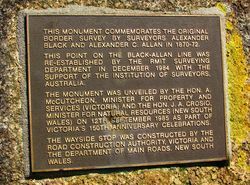 THIS POINT ON THE BLACK-ALLEN LINE WAS RE-ESTABLISHED BY THR RMIT SURVEYING DEPARTMENT IN DECEMBER 1984 WITH THE SUPPORT OF THE INSTITUTION OF SURVEYORS, AUSTRALIA. THE MONUMENT WAS UNVEILED BY THE HON. A. McCUTCHEON, MINISTER FOR PROPERTY AND SERVICES (VICTORIA) AND THE HON. J.A.CROSIO, MINISTER FOR NATURAL RESOURCES (NEW SOUTH WALES) ON 12TH SEPTEMBER 1985 AS PART OF VICTORIA'S 150TH ANNIVERSARY CELEBRATIONS. 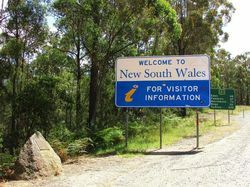 THE WAYSIDE STOP WAS CONSTRUCTED BY THE ROAD CONSTRUCTION AUTHORITY, VICTORIA AND THE DEPARTMENT OF MAIN ROADS, NEW SOUTH WALES.